*Multiple births includes the birth of twins, triplets, quadruplets, quintuplets or more. Source: CICH graphic created using data adapted from Statistics Canada. Table 102-4513 – Live births, weeks of gestation indicators, by characteristics of the mother and child, Canada, annual (percent unless otherwise noted). http://www5.statcan.gc.ca/cansim/a26?lang=eng&retrLang=eng&id=1024513&&pattern=&stByVal=1&p1=1&p2=-1&tabMode=dataTable&csid= -accessed June 20, 2017. In 2013, there were 12,543 multiple births* in Canada – they accounted for 3.3% of all live births. That proportion had not changed since 2009. 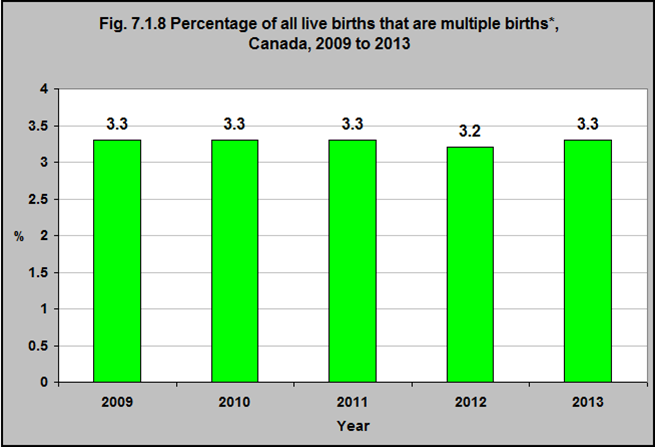 1Facts and Stats: Multiple Births in Canada, Vanier Institute for the Family Transition, Volume 44, Number 1. 1Multiple Births Canada. Multiple Births: The Possible Risks. Part 1: Risks for the Mother. 2011. http://multiplebirthscanada.org/mbc_factsheets/FS-PN_RisksforMothersPart1.pdf – accessed June 20, 2017. 2Multiple Births Canada. Multiple Births: The Possible Risks. Part 2: Risks to the Children. 2011. http://multiplebirthscanada.org/mbc_factsheets/FS-PN_RisksforChildrenPart2.pdf – accessed June 20, 2017. 3Public Health Agency of Canada. Canadian Perinatal Health Report, 2008 Edition. Ottawa, 2008. http://www.phac-aspc.gc.ca/publicat/2008/cphr-rspc/pdf/cphr-rspc08-eng.pdf – accessed June 20, 2017.